Walking is an extremely effective exercise. It can keep you fresh and lively. How can you walk at work? The first thing you must do is park your car a bit away from the office entrance. This way you will have to walk for a few minutes to get to your office. After you enter the building, do not walk toward the elevator. Take the stairs instead. When you walk up, you will certainly feel tired, but after you get to your office, you will begin to feel fresh and strong. Even during your lunch break, divide your time. Allot some time for lunch and allot some time for a short walk. For example, if you have been given an hour for your lunch break, then use the first thirty minutes to eat and use the rest of your break time for a slow walk. If you are overweight, this practice will even help you shed some extra pounds. A lot of office workers who sit behind a desk enjoy snacking while working. If you are fond of snacking, then you should know that this habit is extremely bad for health. If there are vending machines in the cafeteria, then you are likely to eat chips and candies frequently. Junk food will affect your health negatively and it will make you feel lazy. As a result, you will want to go home instead of focusing on your work properly. If you want to stay active at work, then you must avoid junk food and snacking. It’s recommended that you drink a lot of water instead. Water will help you stay fresh and it’s good for health too. But, if you really love snacking, then get some vegetables and fruits to eat. Your body needs movement in order to stay fit. If you sit for many hours, then you will not only destroy your health, you will feel lazy at work as well. It’s advised to get up at least once every hour to avoid problems that are associated with sitting. You don’t have to get up and yawn and then continue the same routine. What you need to do is make a few changes around you. If there is a printer close to you, then move it a bit away from you. This way, you will have to stand up to get your printout. Do some brainstorming and determine how you can get up frequently to move your body. If you don’t follow this advice, you will get tired easily. Hence, you won’t be able to stay active. 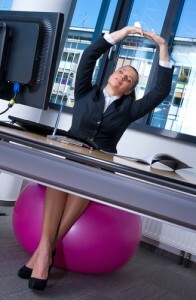 If you want to be active at work, then you need to make yourself active by allowing your body to move frequently. Don’t just get up for a lunch break or when you have to go to the bathroom, try to get up whenever you can. Take advantage of your breaks and use them to walk instead of sitting idle. If you are inactive all day long, then you will not feel energetic at all. So, make some changes in your routine by following the tips mentioned above and you will certainly feel lively every day at work. Eric Philip is an experienced and fervent writer with diversified expertise in education, travel, health related niches. He is currently providing Dissertation Help to students with comfort and ease of mind for them.